The sun is playing peek-a-boo these days and it is the right time to get rid of all the tanning and pigmentation that you have accumulated on the skin over the past couple of months. There are many skin lightening creams and scrubs that are available in the market these days. The Nature’s Essence Lacto Tan Clear cream is one such cream that is meant to remove tan and lighten skin. The cream claims to be rich in milk and honey, two ingredients that are known to remove tanning. Rs.85 for 40g. I got a 25% extra offer when I made the purchase. It comes in a bright yellow 40 gram tube with a flip open cap and a 100 gm tub. It is a thick shiny cream that has a really strong smell. As per the pack instructions, it is to be applied on the skin which is tanned and left for about 15 minutes after which you need to massage your skin gently and then must be washed off. It is easy to spread the cream well on the skin. But it does not really get blended if it is not massaged. So I applied it like a pack in a thin layer over the skin and let it be for 15 minutes. It dries out a little in that time. Following that, I dampened the skin with a few drops of water and massaged it well. Then with a soft wet towel, I wiped the cream off. If your skin is extremely tanned, you can see some of the tan fading off in the first application itself. Otherwise, for mild tanning, you would need a few applications to see the difference. I have used it as a pack on my feet and found the tanning to have reduced a bit. The instructions say that it can be applied on a daily basis to restore natural color and glow on the skin. I am a little wary about using it every day on the face, given that it also tends to bleach the skin. But yes, I have used it on my hands and feet on alternate days after a holiday and it took just a week for my natural skin tone to get restored. The product tends to get stuck in the tube pack at the edges leading to a little product wastage. The tub is thus a better option if you have heavy tanning. 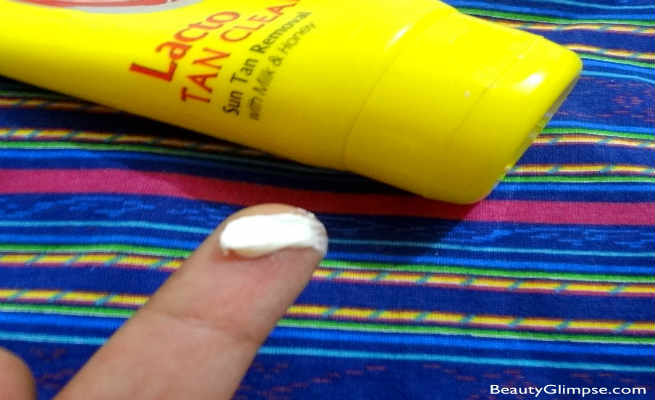 On the whole, Nature’s Essence Lacto Tan Clear is good product to buy if you want to get rid of a stubborn tan without having to resort to more extreme measures like bleaching. Use it with caution on the face, only after doing a patch test. The smell takes a while to wear off, so it is best to do the Nature’s Essence Lacto Tan Clear treatment before your bath. Effective tan removal after multiple applications.